Another beautiful day dawns on the Raid at Far South Camp at Dover. The daily routine is now feeling like normal life. Hearty breakfast , skippers meeting, another favourable forecast, pack the truck and head to sea. Light south east breeze has us tacking out of Port Esperence rounding Blubber Head bearing away onto a quarter run down the coast to Cygnet Point. Suddenly a nasty incident when the Derwent Raider rowed by Julian is struck by a fish farm vessel travelling at high speed. Fortunately it is only a glancing blow and Julian although severely shaken is unharmed. The Derwent Raider is not so lucky, suffering substantial damage to its bow. This incident will be investigated by Marine and Safety Tasmania so I will leave at that. We are all feeling very fortunate, things could have ended very differently. A pleasant lunch was eaten in Sandrock Bay and then another pleasant sail into Cygnet. Afternoon entertainment started with a cocktail party on the mother ship, the tall ship Yukon berthed at the public jetty in Cygnet. Then on to to Burton's reserve for another fine meal provided by the Raid chefs. The pace is picking up. It's a new stop over each day and this was apparent by the empty camp site by 9.30 pm, weary sailors heading for bed in all directions. 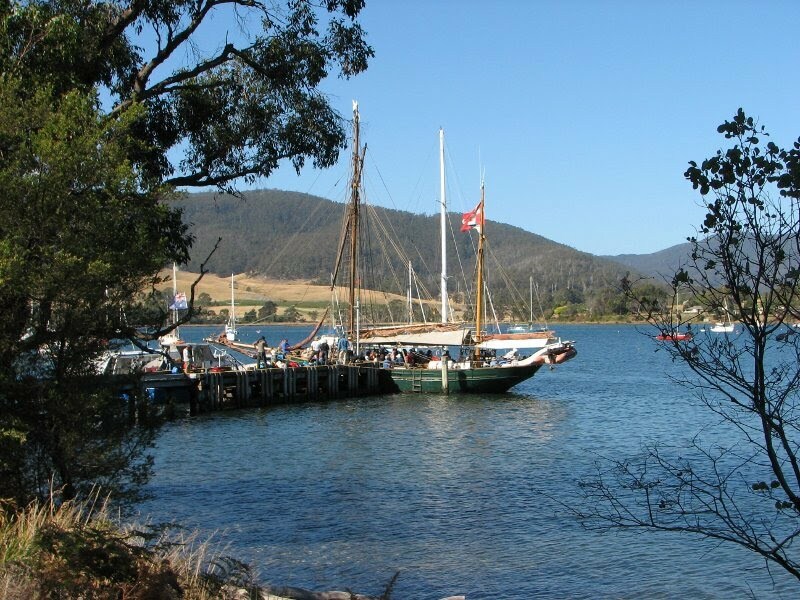 Tomorrow it's on to Allonah on Bruny Island.